The demand for parental controls on computers is rapidly growing as kids continue to get their own personal machines. That’s why Microsoft started to include some of that functionality in Vista and Windows 7, but it is generally pretty basic when it comes down to limiting the amount of time a user can spend on the machine. Daily quota: Specify how much time the user is allowed to spend on the computer on any given day. 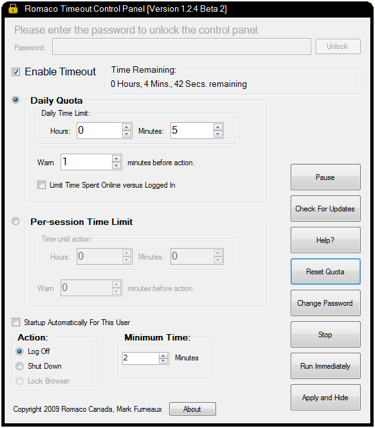 Session time limit: Specify how much time the user is allowed to spend on the computer each time they login. Online usage restrictions: Specify how much time the user can spend online before their browser is locked. It considers you “online” when you have a web browser running. If you close the browser the quota will be paused. If you’re going to use Romaco Timeout I highly recommend grabbing the Beta version because it has some extra features and bug fixes that previous versions don’t have. I don’t expect everyone to go out and grab an app like this, but there quite a few scenarios where I could see this being useful. The obvious use is if you have kids, but it may also be helpful for shared computers and/or kiosks that are in public places (which is where the “per-session” limits would really apply).